Iris went to her first school dance, a 50's theme party. She was so excited. I even made her a poodle skirt. 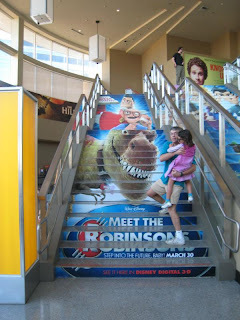 I found out the week before the original dance party date, that I had to attend an important meeting in Denver. Fortunately, the dance party was postponed till this month. But, when the new date approached, I found I had to attend a meeting in DC most of that week. I was scheduled to fly home during the dance. I emailed her nanny and asked her to take lots of pictures. Here are M and Iris, looking quite adorable. The Japanese irises in the backyard even smiled for their photo-op. Fortunately, the meeting ended on time and I arrived at the airport in time to take an earlier flight. I got off the plane at LAX at 7:00 PM and arrived at her school for the dance at 8:00 PM. I am so sleep deprived. The entire week, I found myself unable to fall asleep until about 11-12:00 PDT. Yet, I had to wake up at 7:00 AM EDT each morning--when my body said it was 4:00 AM. I intend to follow up on Rebekka's comment, when I get caught up with my sleep, my email and file my trip report. In the mean time, you might want to read Linda Hirshman's blog post about institutionalizing inequality. "I'm just not enamored of restructuring the work place in order to enable women to bear more of the responsibility for the unjust family." Yeah, in France, mothers get Wednesday's off with full pay to do housework and take care of children during their weekly early dismissal day. No, fathers do not even have the option of taking Wednesdays off instead of the mothers. Employers are compelled to pay the mothers for that time off. Try finding a good job if you are a mother in France. In fact, according to an article (perhaps in Working Mother or Women?) about being careful what you wish for, even childless married women have difficulty finding jobs after they turn 30. So, I don't really look toward France for a solution. Today's NY Times ran two complementary articles about motherhood. Both are worth reading. The Op-Ed page printed Linda Hirshman's Off to Work She Should Go. The Books section reveals Mommy Books: More Buzz Than Buyers. The authors also speculate that the pressure of working and running a household is great. They do not say, however, that working hours have increased as participation has declined. Educated women, they report, work 42.2 hours a week on average and those with professional degrees, 45 — hardly the “80-hour week” of legend. Yeah, I work "part-time", but my total market and family work day is longer than that for most men who work "full-time". Joan Williams' research showed that I am far from alone in this finding. Husbands actually do less housework when their spouses move to part-time work. In fact, they decrease their family work hours by more than the the number of hours their spouses decrease their market work. What has changed in the last decade is that the job of motherhood has ramped up. Mothers today spend more time on child care than women did in 1965, a time when mothers were much less likely to have paying jobs, family scholars report. How did mothers do less childcare in 1965 than today, and do it without childcare centers? Social networks are one answer. Highly trained professionals are expected to move anywhere for their jobs. Not many bring their mothers or other female relatives with them to help with childcare. So, at a time when work demands more hours, the mothers are often displaced from their family support network. Even when family lives nearby, they are often unable to help. Grandmothers are often older and frailer due to delayed childbearing. Younger relatives often perform market work and are, thus, not available for family work. Additionally, professional neighborhoods used to be full of SAHMs who looked after one another's children. Children also used to run around the neighborhoods, playing unsupervised. Mark and I both walked to school without parental supervision at Iris' current age. However, our school district specifically prohibits children under a certain age from walking to school without an adult. Older siblings or older neighborhood children used to accompany younger children to school. That the most educated have opted out the most should raise questions about how our society allocates scarce educational resources. The next generation of girls will have a greatly reduced pool of role models. This is LH's scariest point. I have blogged about this before. My education was costly, for both society and myself. If I don't use it, then society will be justified in denying this type of educational opportunity to future girls on the grounds that the education would be wasted upon them. Should we go back to the days in which universities either banned women, or put a cap on women's admission to reserve the vast majority of seats for "men who would actually use the educations"? The Taliban carries this argument to its logical extreme and bans the education of girls altogether. Perhaps the article was right. Women don't want to read about such a personally painful subject. It takes a certain kind of denial to become a mother. I, for one, am not at all surprised that those motherhood books are not selling well or being read. If you read "The Feminine Mystique", you would know that mothers do not have time to read books. We get, at most 15 minute blocks of uninterrupted reading time--just enough to read a magazine article! Aside: In Britain, women who marry high-earning men have a huge incentive to quit their jobs right after the wedding. Read the International Herald Tribune story about divorce laws in different countries. I stood in front of a display of children's Crocs at a store yesterday. All the shoes were priced at $24.95 even though some shoes were made in the US, others in Mexico, but most in China. Guess why I found that incredibly insulting to the consumer. Plot up the number of American students majoring in Marketing, Merchandising and Manufacturing (engineering) as a function of time. I am worried for our nation's future, are you? I drove my 4200 pound minivan around today while running errands. I feel really badly about that, especially because today is Earth Day. 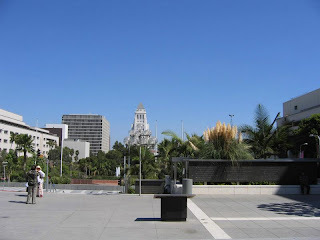 My mind wandered back to Daniel Nocera's talk at MIT on the Road, LA Edition, last month. I am posting some of his slides today, with his permission. Click on the pictures to view them in full detail. I put my own notes below each slide. 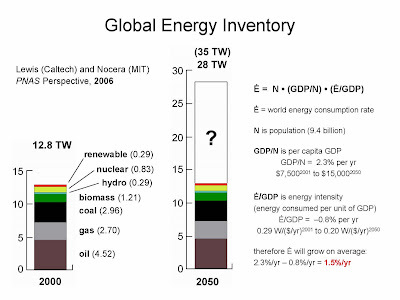 Slide 1: Our current global energy inventory is shown to the left. Nathan Lewis and Daniel Nocera performed some back of the envelope calculations to predict future energy needs using middling estimates for population growth, economic growth, and energy efficiency gains. (28 to 35 Terra Watts (TW) are a couple of reasonable rough estimates but the figure could be much, much more, unless we change our behavior drastically.) 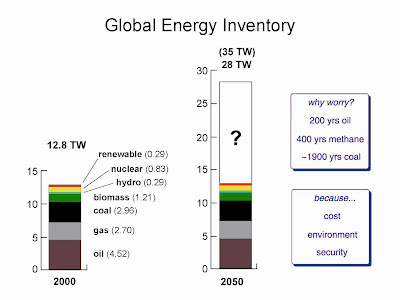 That leaves us with a big fat question mark for future energy sources. 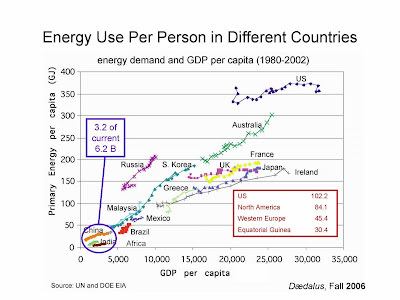 Slide 2: I find this slide showing per capita energy demand in giga Joules (GJ) versus per capita GDP for a variety of nations especially embarrassing. It shows how much we produce per unit of energy. The lower left hand corner represents 3.2 billion of the world's 6.2 billion people. The box at lower right shows relative energy consumption per capita in units that I forgot to note down. If energy consumption per capita were distributed equally, the figure would be close to the current usage in Equatorial Guinea. We lead the world in per capita energy consumption--by a lot. Equally rich industrial nations are much more frugal with their energy. See how the US's per capita energy consumption has been flat for two decades? It's only party due to gains in energy efficiency. It is largely because we stopped manufacturing things and now import so much of our industrial goods. I will blog about that later; in the mean time, you can read Goodie Bags and the Wealth of Nations. Slide 4: Balanced Redox (reduction and oxidation) equations for the combustion of coal and methane, the main component of natural gas. 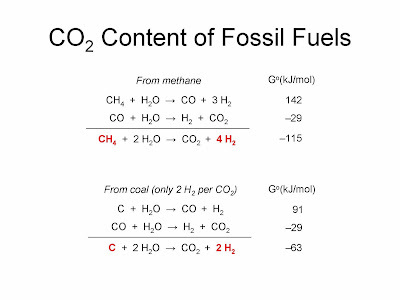 Note that methane produces about twice as much energy per molecule of CO2 produced than coal. (A negative value means that energy is released.) Oil is largely composed of alkanes, chains of carbon with some hydrogens hanging off them, produces a middling amount of CO2 per unit of energy compared to coal and methane. 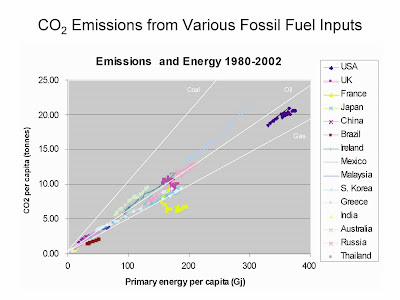 Slide 5: CO2 emission versus primary energy consumption per capita. This graph illustrates the types of fuel used by the nations. For instance, the US (indigo blue) uses mainly oil and gas with some coal. Japan (light cyan blue) uses a mixture of oil and coal. France (yellow) falls dramatically below other industrial nations because of their reliance on nuclear power. Look at China and India in the lower left hand corner. They represent over one third of the world's population. If you want to be really scared, read this projection of world population from the International Institute for Applied Systems Analysis. Slide 6: This is a popular graph of CO2 concentration versus time measured at the top of Mauna Loa, a volcano in Hawaii. The small zig zags demonstrate that the earth is a living, breathing entity. 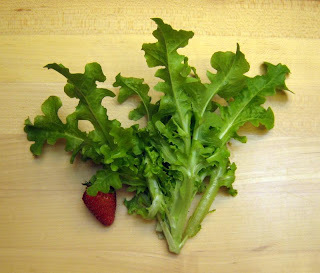 Plants absorb CO2 in the growing season. Because there is more land surface in the northern (boreal) hemisphere than in the southern one, there are slight depressions in CO2 concentrations each boreal summer. However, the overall trend is up. That means we are putting much more CO2 into the atmosphere than the planet can absorb. 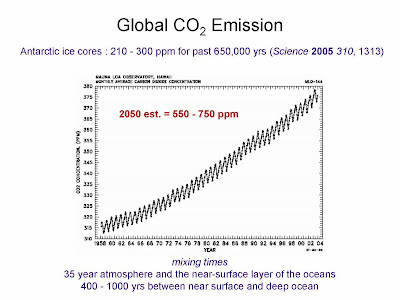 Antarctic ice cores show us that the level of CO2 in the last 50 years is unprecedented in the past 650,000 years. Mixing times (the amount of time it takes to thoroughly mix a system) are shown below. It takes about 35 years to mix the atmosphere and the top layer of the ocean. It takes about 400-1000 years to mix the top layer of the ocean with the bottom layer. Slide 13: I fast forwarded through all the pictures of retreating glaciers and coral bleaching. They are too depressing to show. 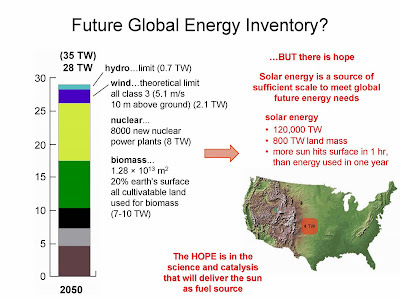 This slide shows that there is probably no way to get from here to there without letting go of my opposition to nuclear power. It also demonstrates that windmills will not be sufficient. However, solar power holds a great deal of promise. I have some professional experience with advanced photovoltaic technology and I agree with Professor Nocera. I also have some personal experience with low-tech solar hot water panels and I think almost everyone should have them. What will the future look like? It largely depends upon our own collective behavior. Nocera says take a good look at Equatorial Guinea. I say, add some energy saving technology. Change some of our personal behavior. It could be a nice place to live. But we have to act now. The longer we delay, the more bitter the medicine. Note: The slides are from Daniel Nocera, but the notes are mine. I am responsible for all errors. Iris, her friend and I went to Mr. B's Bricks after school today to play with Legos. Iris and her friend built counter-balanced drawbridges. Iris was the youngest child in the class (6, 7 and 9 year olds in that session) and also the least experienced. She asked for my help and I went over to her table. The instructor on duty, Mr. Ken B (Mr. Aaron B's partner), intercepted me. He said that the point of the class was for kids to explore on their own without parental intervention. He gave me my own Lego Mindstorms kit and sat me down at a table at the other end of the classroom. Ken's teaching style was wonderful, the way that he never told any of us what we did wrong. He lead us through a series of questions until we figured it out on our own. Once we completed the basic bridge setup, Ken extended the bridge and told us to rebalance the mechanism. Iris' friend did the popular solution; he added length to the lever arm on the counterweight end. He did this instinctively without any pictures or instructions to lead him. I moved the pivot point around. At first, I moved it in the wrong direction and then made iterative adjustments, one notch at a time. Even then, the balance wasn't quite right; I needed a pivot point between two holes. 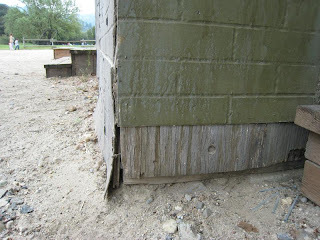 Then I added a brick on the underside of the weighted brick and got it just right. It turns out, I made the alternate, less popular solution. It hadn't occurred to either of us, that there were other solutions. We were all so focused on our own work. 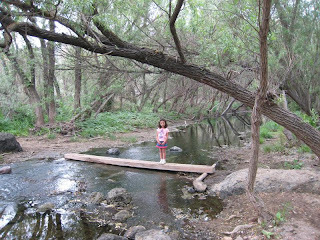 Iris completed her basic bridge, but did not have enough time for the extension exercise. We both agreed this would be our mommy and me Friday afternoon activity from now on. It didn't occur to me until after dinner that, next Friday afternoon, I would be on a plane flying from DC to home. I guess Mark could take her, but then I would miss Lego class. Mr. Anton (site works in IE or Safari, but not in Firefox) charges for both the parent and child in his Mommy and Me Tae Kwon Do class. Mr. B's Bricks charges only for the child in the class. That's a bargain. If you look at Anton Kasabov's modeling portfolio on his website, you will discover why his Mommy and Me TKD class is so popular. ;-) That's not completely fair. It is obvious that he teaches for the love of children and TKD. He earns his main income elsewhere. Mr. Anton's students will be giving a demonstration at Polliwog park this Sunday at 3 pm. Weather permitting, Iris will be there. Maybe you will get to see her break a board with her roundhouse kick this time. She says she is nervous; she fears she won't live up to her performance last time. We got weather and more might be on its way this Sunday. It actually rained 0.32" today, yippee! See the 24 hour rainfall data at CNRFC-AWIPS. Included in the $750 million first phase, which extends from First to Second Streets and reaches 35 feet from Grand Avenue to Olive Street, are 400 condominiums in two towers, 48 and 24 stories respectively, to be priced at around $1,000 a square foot or higher; 100 apartments devoted to families earning less than $35,000 a year; 284,000 square feet of retail space; and a 16-acre park linking the Music Center and City Hall to replace an unused swath of sloping green space near the government buildings. As part of an agreement with community groups and public officials, Related Companies is to advance $50 million of its ground-lease rent toward the cost of the park. The agreement also requires Related and its tenants to meet specified hiring and wage goals and to set aside one-fifth of the units for low- and moderate-income residents. In exchange, officials have agreed to just under $100 million in subsidies, principally from hotel tax revenues, said William A. Witte, the president of Related California. If I am doing the math right, that is $1,000,000 per low- and moderate income unit. That's public private partnership for you. I can get you a $800 hammer to go with that. Downtown redevelopment is a laudable goal. But this effort has gone seriously awry. It does not take into account what Angelenos really need. We don't need more luxury housing. We need more housing for the working poor. A Whole Foods would be nice, but a basic supermarket is sorely needed. Moreover, that is not an "unused swath of sloping green space near the government buildings", it is a very rare opportunity for an ordinary person at street level to get a good long view of the city. Here is the view from the government building side of the street. I actually had to wait a while and angle my camera just so to get this picture without a pedestrian. This park is very popular with strollers. There is not much green space downtown. Here is the view from the steps of the Music Center on the other side of the street. Note the black granite slabs? They didn't used to be there. Here is my eye level view. 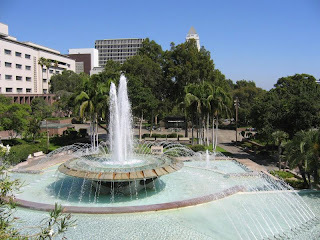 We used to have season tickets to the Mark Taper Forum a few steps from where this photo was taken. A few years ago, this view was unobstructed. You could sip your coffee or wine before the show and look at the gorgeous vista over a bed of low-lying roses. 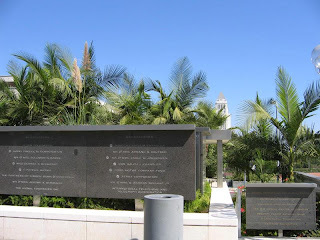 Then, the black granite slabs appeared to aggrandize the donors and obstruct the view of everyone else. Couldn't they think of another way to recognize their donors? Wait, Mark and I donate annually, why aren't our names on one of the slabs? No one asked us if we would rather have the black slabs or the view. They must have been aware of what they were doing. A year after the black granite slabs appeared, so did the roses. The were replaced with taller palms and pampas grass to get rid of the evidence that a gorgeous and rare long view was demolished for no good reason. When I find them, I will post pictures of how not to turn your donors into view-killing villains. Wash day at my sister's is awfully pretty. 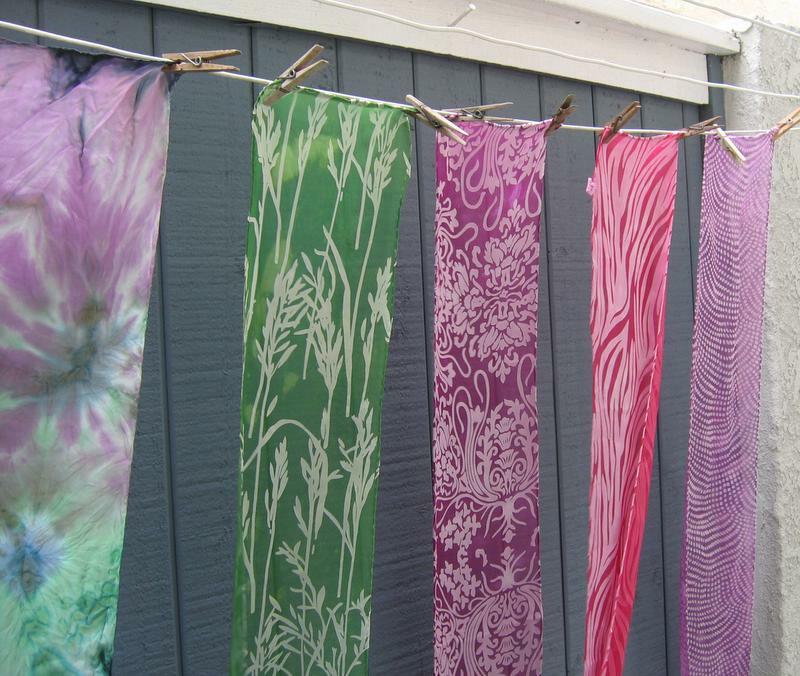 Wash day at my house is more mundane, unless I have been up to some tie-dyeing or shibori. I didn't knit at all this weekend. Instead, I have been gardening and doing laundry. Like several commentators said, we hang our clothes inside out on the line. We also wash them inside out to minimize fading and wear on the clothes. Shirts are tumbled in the dryer for a few minutes and then hung up damp. In Boulder, we lived in a house wired for electricity circa WWI. Plugging in an iron without tripping the circuit breaker involved unplugging everything else in the house except the refrigerator first. I figured, if ironing ate up that many watts, then not ironing would be the patriotic and green thing to do. I thought of this 15 years before Thomas Friedman wrote about it. We smooth the plackets, collars and hems down by hand while the shirts are damp and look slightly rumpled most of the time. We are scientists after all; people find us more credible when we look rumpled. We iron only when attending special functions and, of course, when I am sewing. Isn't the clothespin bag in the shape of a dress and apron adorable? I bought it from an elderly lady near Chama, New Mexico. I spotted a sign in her front yard that said, "Quilts For Sale" and made Mark stop. 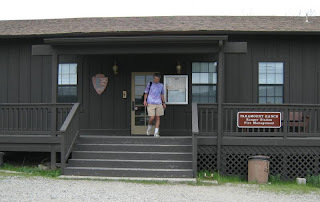 The quilts were polyester doubleknit, her handmade dolls were exquisite and priced accordingly, but the clothespin bags were the perfect souvenir. 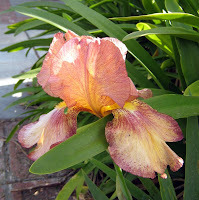 The Siberian irises are abloom in the front yard. A friend and neighbor gave me the irises when she divided her corms. I like it when neighbors share plants and seeds. It makes a neighborhood a neighborhood. I have a bunch of flower and vegetable seeds to give away if you drop by the house. 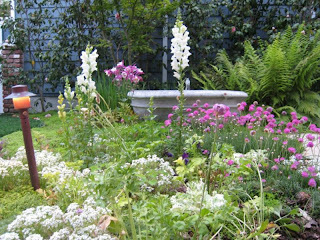 If you bring a bucket, you can dig up some anemones, too. 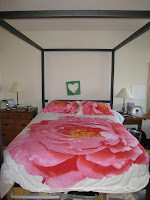 Peonies are abloom in the bedroom. Mark is really a good sport. He sleeps on pink sheets and our bed faces pink (really, plum blossom) curtains, and he has never complained. Come to think of it, he might not have noticed yet. Iris got the butterflies set with a matching blue and green lava lamp. Iris put the green heart up for Valentine's day. We like it too much to take it down. 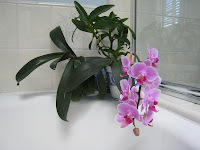 Orchids are abloom in the bathroom. 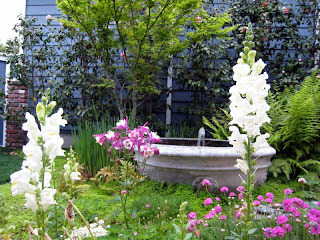 I would like to turn the bathtub we rarely use into a greenhouse so that I can collect more orchids. This time of year, many Americans are struggling to finish their tax returns on time, cursing the IRS in particular and the US government in general. I would like to write a thank-you note to the American taxpayer. I am a beneficiary of your (and my own) largess. I read a while back that it costs hundreds of thousands of dollars to train a PhD level scientist; most of that cost is borne by a combination of federal and state funding. Mark and I are no exception; we both received subsidies, scholarships and stipends from state and federal entities in addition to private money. In contrast, taxpayers pay several times more to train a military pilot. Tellingly, during the dot-com boom of the late 1990s, the two types of officers not allowed to separate from the AF at the end of their enlistment terms were pilots and meteorologists. Not only were we trained on taxpayer dollars, but we are still on the dole today, working in a federally funded laboratory. In the past two years, I have been paid by a variety of federal sources including DOD (USAF), NASA, DOC (NOAA) and DOT (FAA). It gets worse. I had the audacity to give birth and take maternity leave, paid for by your tax dollars. Moreover, I had the cheek to become severely ill, consume large quantities of health care and go out on medical disability leave for several months. That medical care and time off was paid for by a combination of our savings and your taxpayer dollars. I try to give you good value for your tax-dollars. But I have competing priorities as I need to also focus on my recovery and raising my daughter. I can not maximize the training that you paid for by working around the clock. Although, if I die prematurely, that wouldn't maximize your training dollars, either. I work ‘only part-time’ for a scientist, 36 hours a week. I really can’t run any faster. I am sorry. But thanks for the health care. It was, literally, a lifesaver. Now let’s do the important work of building a nation that is worth funding and defending. PS. I am not arguing that our current tax system is optimal or even fair. I am just saying thanks. Read the entire article, He’s Not My Grandpa. He’s My Dad. Skills are usually passed down from parent to child. But, what happens when a skill is lost and your parents don't know how to use a clothesline? Then people turn to search engines or the media. 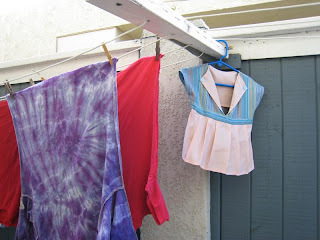 Today, the NY Times ran an article entitled, to fight global warming, some use a clothesline. Unfortunately, the pictures show her using it wrong. The LA Times ran a similar article a few weeks ago in which the pictures also showed the writer using the clothesline wrong. If you hang your shirts up right side up and clip them at the shoulders, you will have funny-looking peaks at your shoulders. Is that really what you want? Hang your t-shirts up-side down so that the clip marks are in a less noticeable location. You wouldn't want to have to iron your shirts to get those marks out. Irons draw a huge amount of wattage, negating some of your energy savings from using the clothesline in the first place. Smooth out your clothes while you hang them up to minimize ironing. Fold the top of your towels and sheets over the line slightly. That will make them more secure and less likely to blow off the line. 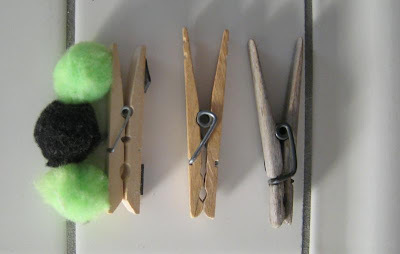 Use more than 2 clothespins for heavy items. Hang your clothes in the shade. Sun fades dyes. Our grandmothers knew to hang their clothes in a covered or partly covered area so that their clothes did not fade. It also gave them more time to get the clothes inside in case it started to rain. Keep an eye on pollen count. If someone in your household is allergic to pollen that is flying at the time, hang your clothes inside or use your dryer. I give you permission. In our household, we dry all bedclothes and sheets inside because of our allergies. Wipe down your clothesline before each use. Pollution, pollen and dust cling to them. 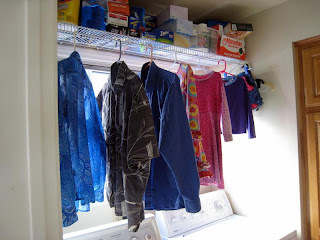 Indoor clotheslines make a great deal of sense in areas with afternoon thunderstorms. In fact, I knew two families in the Boulder foothills who hung their laundry indoors as a way to save energy and to humidify their homes. Who cares if you have laundry in your living room if you are at work or school? She also complained about how the wooden clothespins she initially bought fell apart quickly. I took a picture of clothespins you will find in my house. The one on the left, with the pom poms glued to it, is the style you will find most frequently in the stores. They are made in China and extremely cheap. The other two are made in the American Midwest and harder to find. They cost twice as much as the ones from China. I have used the one on the extreme right since 1990. I bought the one in the middle about two years ago. The American-made ones come from McGuckin Hardware in Boulder; they don't even bother to stock the cheap imported ones. Anyway, our local Home Depot only stocks the cheap ones that you don't want to use. In case you do not live near McGuckin Hardware, you can go to your independent hardware store. Our local owner stocks only the cheap Chinese-made ones but will special order the American-made ones for you. It takes a few days, but it is worth the wait. Maybe if enough people insist on the better American-made ones, the default item stocked in stores will be the American ones. The writer of the article also bemoaned the 7 minutes it took her to hang up her laundry. Perhaps she is one of those people who drives to the gym to lift weights. Think of it as an upper body workout. She should also not worry about her neighborhood clothesline police. Since the California electricity crisis of summers of 1999 and 2000, the state legislature has passed a law preventing homeowner's associations from punishing clothesline users. I do find hanging laundry beautiful. But we should do it because it makes sense, not to signal our environmental convictions. If we want to save carbon and achieve energy independence, we will need a clothespin that can securely hold heavy and wet laundry. Clotheslines Again shows how I hang my laundry. Clothespin Extinction discusses the end of clothespin production in the US. 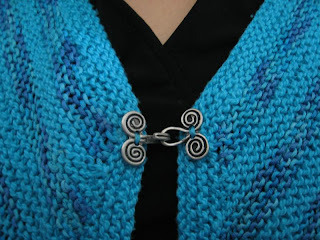 A reader offers her own favorite clothespins and source. The comments for this post offer many tips. One of the happiest milestones in my life is when Iris started reading bedtime stories to me. After I fall asleep, she quietly tiptoes to her own bed. She is reading Beverly Cleary's Beezus and Ramona to me this week. It is very dry, and it is about the become drier. The US Drought Monitor says we are in an extreme drought in southern California. You may wonder, just how bad is it? The National Weather Service has a page full of Precipitation Data links. It is bad; LAX has received only 2.16 inches of rain so far in this water year. We typically don't get much more in the late spring and summer. Remember the skewness of the rainfall distribution I mentioned before? Even though we have received 18% as much rainfall as an average year, we are at more than that compared to a median year. There are simply more dry years than wet years. The relatively few extremely wet years make the average rainfall substantially higher than the median rainfall. In fact, the western US may be heading to a permanent drought. The LA Times has a good story about this. What if the climatology that the water treaties were based upon water data from an anomalously wet period? Now that we have a more complete climatology, we know that more water has been promised than typically falls. The story is even bleaker. Many parts of the west have been supplementing rainfall by pumping water from the Oglala aquifer. According to the USGS, this ancient water, stored up over a period of hundreds of thousands of years, is being depleted at a rapid rate, especially in Texas and Kansas. Water in storage in Texas was down by 27% between the 1940s and the year 2000. Depletion is especially severe in the Lubbock, Texas area. What is the water used for? To grow cotton in the desert, possibly to make T-shirts that no one really needs. Fashion Incubator has been blogging about sustainable fashion. As usual, her reasoning is sound and backed up with data. 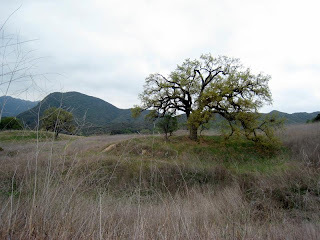 We went hiking today at Paramount Ranch in the Santa Monica mountains. Note that the sign says "Fire Management". Compare the parched landscape below with Unseasonable Lushness from June of last year. Same hills, 10 very dry months apart. The wildflowers were mostly absent. We saw some wildlife. 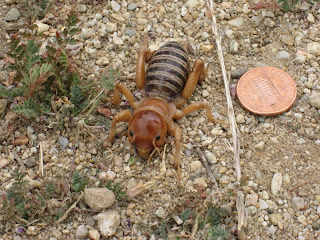 Anyone know what this is? 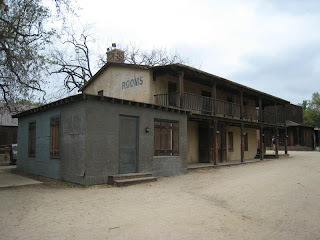 We strolled through the western town filmed in many westerns. It is called Paramount Ranch for a reason. 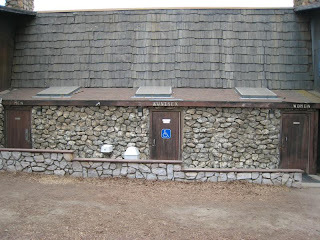 Look at the back of the above building. Can you imagine one of the tough guys in the westerns walking around the building to use the changing table in the unisex bathroom? Nothing is quite what it seems in the movies. The buildings are not even really brick. Look at the facing peeling away below. 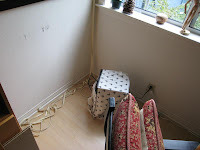 We followed the pipe and heard a very bad gurgling sound coming from this corner of the living room. No, it was not coming from the subwoofer (wrapped in the Indian ikat fabric). Unlike our back neighbor, the leak was not in the middle of the living room floor. It was accessible from the outside wall. Now, to find a mason who can repair the brick facing. Iris helped me do a little spring cleanup in the garden today. She is learning to distinguish between the things we want to grow and the weeds. She was disappointed that the alliums we planted last Fall did not come up. 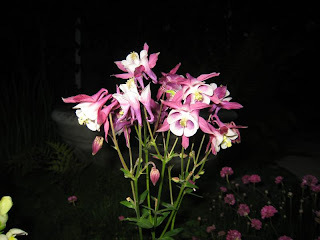 Years ago, I planted some columbines. Even though my gardening book says they are biennals, they keep coming up. At least, the red California one does. 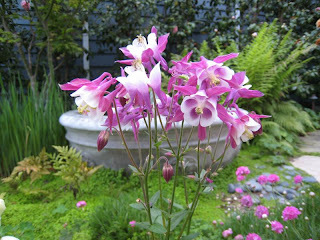 The blue Colorado columbine stopped coming back. It is like the flowers know where they belong. The blue one by my front door in Boulder invariably came back up each summer. I took this picture with a flash just before sunset. I took another picture without the flash. What a difference. Another gratuitous shot of the garden. I do love it when the sea pinks come back each summer. Iris and I even harvested some food. There was a famous gardening article about the $4000 (or some astronomical figure) tomato. I don't want to calculate how much this strawberry cost. That is besides the point. We grow food so Iris feels a connection to the food chain. Make your own at fd's Flickr Toys. 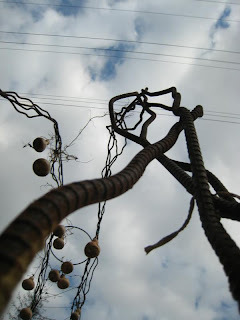 Deb over at Red Shoe Ramblings sometimes posts pictures of things from unusual vantage points. I especially like the ones where she points her camera up from low on the ground. I started doing the same thing. I took the above picture last January at Descanso Gardens. It looks like something out of Dr. Suess. I went for a walk in Boulder after the rain. 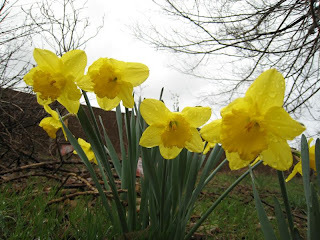 The daffodils were all bent down, but they smiled for the camera when I put the camera close to the ground. I have been rereading Believing is Seeing: Creating the Culture of Art by Mary Anne Staniszewski. 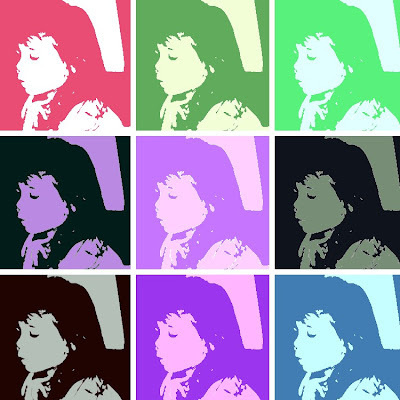 By her definition, these photographs are art because I made them to circulate in the mass media! Go visit Red Show Ramblings. Deb is showing interiors of her own home. It is a bracing antidote to the stultifying sameness of styled interiors in slick magazines. She, and other bloggers, are also showing pictures of their bookshelves! The management of the Tribune Company picked a buyer. Why did they choose a buyer that will put virtually none of his own money on the table when there were other bidders with deep pockets willing to pour money into the papers? Could it be his professed lack of interest in the news business? Could it be because the winning bidder promised to leave the management team that oversaw the decline of the company in place? Could it be the big fat golden parachutes aka "change of control payments" ($200-269 Million) he offered the top executives? That would be too cynical. I can't see into the hearts and minds of others. However, I do have to wonder about the structure of the deal. "In the first step, Zell would invest $250 million in Tribune. Of this, $50 million would purchase 1.5 million shares of newly issued stock at $34 a share, and $200 million would essentially be a loan convertible into shares at the same price. Simultaneously, the newly minted ESOP would invest $250 million lent by the company to buy stock at $28 a share." The guy will put up $250 million of his own money, only he won't really do that. He will receive shares or convertible bonds that he can sell or trade. The employees of the Tribune Company won't get off so easy. All future contributions of their pension plan will be invested into paying off the debt of this hugely leveraged buyout. The company will also "borrow" $250-Million from their pension fund right away. So, that means the employees will be compelled to put more money into the business than the new owner. Yet they won't have any say into how the paper is run. They won't even have a say about whether they want to be part of the deal. When Enron went bust, we shook our heads at how the employees could have been so stupid as to put their retirement money into their employer. That's just too risky. Every financial planner warns against this. You could lose your job AND your retirement money in one fell swoop. Yet, this is exactly what is happening. How can this be legal? No one asked the employees whether they want to gamble their retirement money. Shouldn't the pension fund be their money? Actually, no and that is precisely the problem with American pension funds. Big checks for execs who lose jobs Gee the payout to the execs is suspiciously close to the amount being looted borrowed from the pension fund. 10 years ago, I moved from Boulder to Los Angeles and joined the El Segundo chapter of The Knitting Guild Association (TKGA). I had not knit since the 1980s and did not understand much about knitting and fibers then. In warm Los Angeles, I should knit with cotton, right? 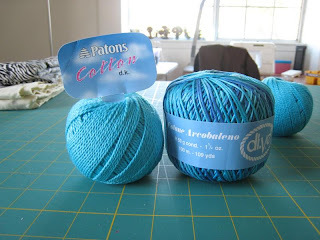 The back room of Yarns Unlimited had many tasty colors and I settled upon these two DK weight yarns. I had never knit with cotton or in garter stitch before. I had no idea that I would have to go down to a size 2 (!) needle in order to make a fabric that I couldn't see through. I brought my yarn and little swatch in to show Joyce. She was much to polite too tell me to cease and desist. She just stared at my choices for a minute and then complimented the subtle stripey effect of the yarn combination. But, I should have paid more attention to the expression on her face. My sister was a bit more blunt. She looked at the sweater in progress and asked what I was thinking. Garter stitch stretches. Cotton stretches. Bias knitting stretches. I would not have a sweater when I was done; I would have a sack. I persevered because big sis could not be right again-at least this time. I lost my way several times. Each quadrant of the sweater body should have had the same number of stitches by the time I got up to the shoulder join. Alas, stitches mysteriously appeared and disappeared and the sections refused to match up. I fudged the stitches to make those suckers join at the shoulders. The bands were another trial. The first time, they came out much too loose on one side. I ripped out and began anew, picking up a matching number of stitches on each side. The sweater looked too short so I added a triangle edging in garter stitch that looked so cute when I used it on one of Iris' baby sweaters. The bottom edging was too tight so I ripped it out and I knitted two more repeats. I should have listened to big sis (and my inner knitter). This sweater did not want to be. I could not decide how to fasten the sweater so I put it away in the closet. Today, I found the perfect clasps while browsing at the Cotton Shop. I have decided to call the sweater complete. Look at the lemons ripening on the tree behind me. There are still a few late-season camellias on the trees. Look at the cute new gardening clogs. Look at the fake grass we put in to do our part for water conservation during this drought. 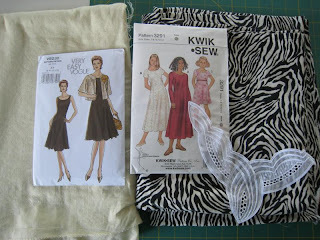 Iris and I got the spring sewing bug. She decided to try both the black and white graphic print and the animal print trend at the same time. I found this lovely zebra print at the Cotton Shop. I decided that I must have a trapeze jacket in a light linen. I found the cream linen at SAS fabrics. I also bought Iris' applique (0.01 pounds = 14 cents) there. See the Top-down Hall of Infamy for other knitting disasters as I learned that my ideal armscythe does not match the Incredible, Custom-fit Raglan Sweater. My incredibly industrious coworker put in a meadow of drought-tolerant native plants. 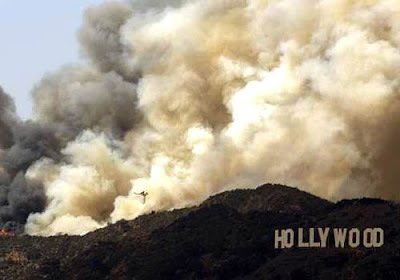 Take a look at the photo galleries from the LA Times story about the Hollywood fire. Why does the fire burn only on one side of this ridge? Remember that fire is a river that runs uphill? Do you see the wind direction? Note that the fire spread uphill and flowed into another "fire basin" only in the downwind direction? You can see it clearly in the Europa Technologies/Google Earth annotated map below. Mark rescued Iris from a hungry dinosaur yesterday at the Bridge. Iris celebrated her rescue by dancing and singing with the frogs. 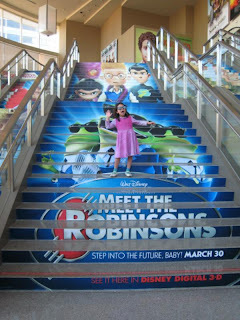 Mark said that the space-time continuum was not handled in a consistent manner throughout the movie, Meet the Robinsons. Methinks they put more thought into the 3D rendering than into logical consistency. Iris gave it 4 stars anyway. Then we all went to chow down on freshly-made tortillas at Paco's Tacos on Centinela. As usual, there was a long wait. Iris and I spent some of that time saying hello to the fishes. The puffer fish was not puffing last night. But the polka dot fish was runway ready. It has not just the black and white graphic pattern thing going on, but also the bright yellow accents that are so au courant this season. The lionfish was also ready for its closeup. What did Jane Austen look like? Who cares? I never wish I knew how pretty Austen was or how she dressed or how her voice sounded. (On the other hand, I wish intently that modern publishers did not care how handsome or beautiful their authors are.) But let me put it a different way. I would like to know how anyone who lived 200 years ago talked or sounded or dressed or ate or felt. Well, he could just get himself a copy of What Jane Austen Ate and Charles Dickens Knew: From Fox Hunting to Whist-The Facts of Daily Life in Nineteenth-Century England by Daniel Pool. Jane Austen and Charles Dickens wrote about universal themes, but you will get much more out of reading them if you read Daniel Pool's book, too. While a student at Berkeley, I visited my mom's house on break with a copy of Persuasion. When I left, I couldn't find it. The next time I visited her, I found the book on her bedside table. I asked her what it was doing there. She said that she found it somewhere around the house and started reading it. I asked if she found the nineteenth century English difficult to comprehend. She replied that it wasn't especially difficult. Mom found the novel hilarious. She said that the English aristocracy was just like the Taiwanese aristocracy. And people wonder why Ang Lee made Sense and Sensibility. Verlyn Klinkenborg was so right. Read this press release from the LA Times. "The redesigned BOOK REVIEW will be more visual, featuring portraiture and enhanced photography"